Standing on dry grass where there should be five feet of snow on April 1, Gov. Jerry Brown called for mandatory statewide reductions in water use and announced a suite of new state actions to conserve water use, increase enforcement of water use restrictions and streamline drought response by state agencies. 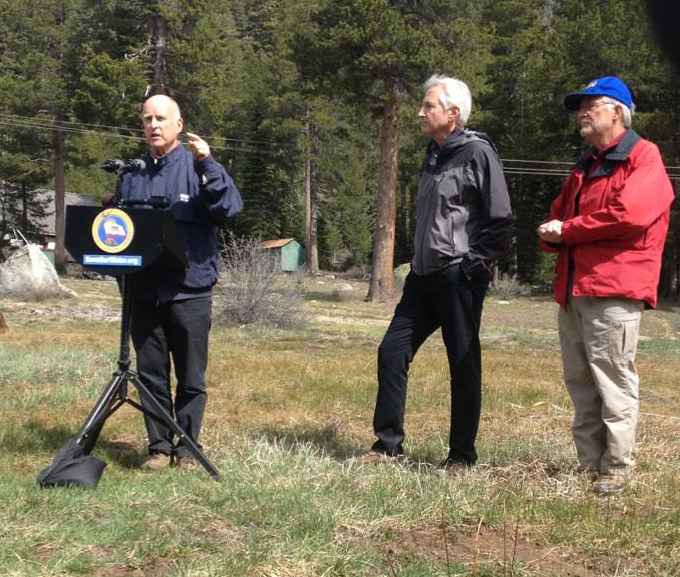 Brown unveiled the actions, outlined in a new executive order, during the state’s manual snow survey at Phillips Station in the Sierras. The April 1 snow survey, considered critical to gauging the snowmelt that will fill the state’s reservoirs in summer months, revealed no snow whatsoever at the site. It is the first time since recordings started there 75 years ago that the meadow was void of snow. “We are standing on dry grass and we should be standing on five feet of snow,” Brown told the dozens of reporters assembled at the site. 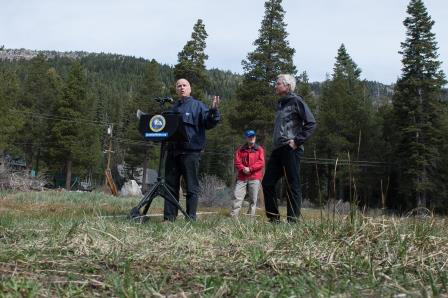 Brown’s visit marked the first time a sitting governor has ever attended a manual snow survey — a fact that underscores the severity of the drought and the public resources that are being directed toward it. 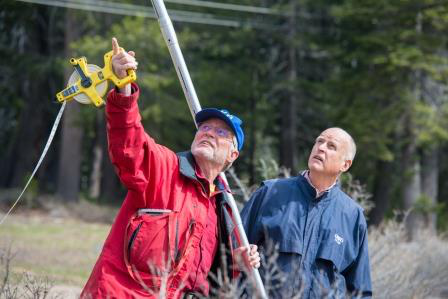 Frank Gehrke, chief of the California Cooperative Snow Survey, highlighted the unprecedented nature of the survey, saying it the first time he has ever seen the meadow at Phillips Station void of snow since he has been conducting the surveys since 1988. “This blows it out unequivocally,” Gehrke said. “This is the lowest on record…This is bad news for the state’s water picture.” Speaking to reporters during a conference call after the survey, Department of Water Resources Director Mark Cowin said that statewide the snowpack is at about 6% of average for the date, portending a bleak runoff for the months ahead. The executive order directs the State Water Resources Control Board to implement mandatory water reductions across the state to reduce water usage by 25%. Areas with higher per-capita water use will be required to achieve proportionally greater reductions in water use than areas with low per-capita use. Felicia Marcus, chair of the State Board, said during the conference call with reporters that the severe drought is causing the state to take actions it has never before taken. “Unfortunately, voluntary efforts haven’t provided the savings we wanted,” Marcus said of the mandatory water reductions. In addition, the Department of Water Resources is tasked with leading a statewide initiative — in partnership with local water agencies — to replace 50 million square feet of lawns and ornamental turf with water-efficient landscapes. DWR is directed to provide funding assistance for the turf replacement program, which is intended to complement efforts already underway around the state. The State Board also is directed to prohibit irrigation with potable water of ornamental landscapes on public street medians. The State Board is expected to develop emergency regulations to implement the executive order’s directives in the coming weeks. Board approval of the regulations is anticipated in late April or early May following public hearings on the proposed regulations. Press Release from the Office of Governor Edmund G. Brown Jr.